This is a classic old-fashioned Southern-style giblet gravy made with the addition of hard-boiled eggs. If you like an egg-free gravy, feel free to omit the hard-boiled eggs. 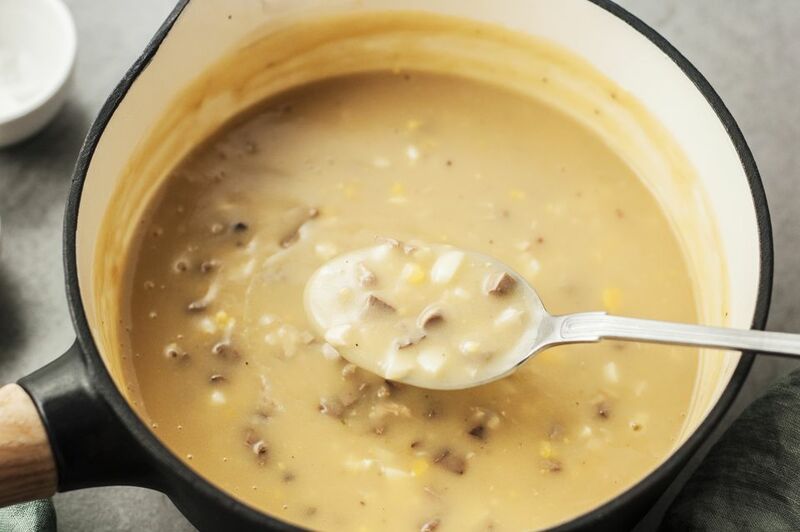 Use this recipe to make a delicious gravy to go with your chicken, Cornish game hens, or roasted turkey. Put the turkey drippings in a gravy separator to eliminate the excess fat. If you don't have turkey drippings, use a good quality turkey or chicken stock. For a richer, creamier gravy, add some heavy or light cream or half-and-half just before it's done. Place a mesh strainer or colander over a bowl. Drain the giblets and set the liquids aside to use in the gravy, if needed. Let the giblets cool. Remove the meat from the neck and chop with the rest of the meat. Melt the butter in a heavy saucepan and stir in the flour. Cook and stir for 3 to 5 minutes, or until the roux just barely begins to turn golden. If you don't have drippings from a roasted turkey or chicken, or if you only have a small amount, add the giblet broth or chicken or turkey stock to make 2 cups. Slowly stir in the drippings and/or broth into the roux. Add the milk or half-and-half. Continue cooking and stirring until thickened. Stir in the chopped hard-cooked eggs and chopped giblets and serve. For a richer, creamier gravy, add some heavy or light cream or half-and-half just before it's done. Add a medium sliced onion and 2 stalks of sliced celery to the saucepan along with the giblets. If desired, use strain and reserve the giblet broth to use along with the drippings. Add 1/4 cup to 1/2 cup of finely chopped onions to the butter and saute until tender before adding the flour. Add a few tablespoons of minced shallots to the butter and sauté until tender. Add about 1/2 teaspoon of chopped fresh sage, 1/4 teaspoon of finely chopped fresh rosemary, and a pinch of fresh chopped thyme leaves.